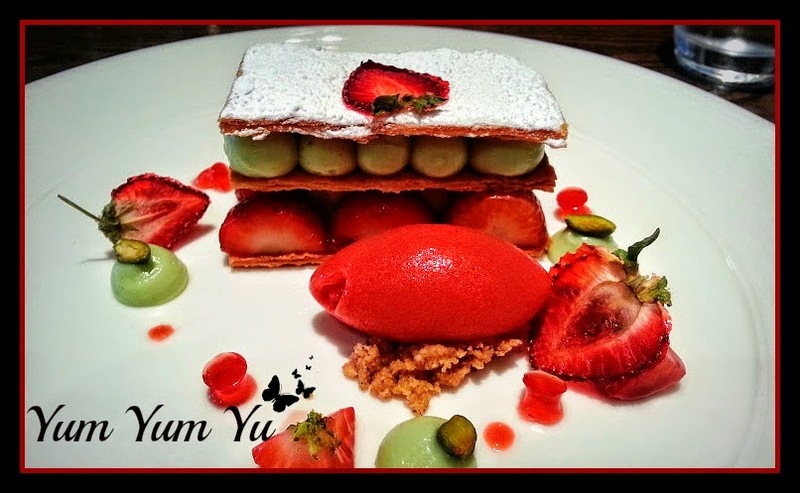 Yum Yum Yu: Opus One (Radisson Blu Edwardian, Manchester) - a little bit of luxury! Opus One (Radisson Blu Edwardian, Manchester) - a little bit of luxury! After my very average meal at Mr. Lau's the previous evening, I was very much looking forward to Afternoon Tea at Opus One in Manchester. My friends, Wing and Sybil, had booked this place because we all love a good afternoon tea. When they told me it would be posh, I immediately went online to check it out in order to prepare for what I would be expecting. Posh looking indeed! I had been standing outside of the grand looking Opus One for about 15-20mins (I don't feel comfortable entering posh places on my own) when I received a message from Sybil to turn around - turns out she was already inside and spent a good 5-10mins trying to knock on the window behind me to get my attention! If Opus One had not intended for their glass to be sound proof, well they're in luck. Even when inside, I couldn't hear any of the external traffic noise. When we originally entered Opus One, what blew me away was the beautiful decor - clean smooth lines, dark glossy furniture with a hint of red coming from the chandeliers and walls, and large chess pieces dotted about. All this along with the high ceilings certainly made me feel like I was in some grand theatre. We walked through the luxurious restaurant and in to the side room that has full length windows looking out on to Peter Street. We sat on the beautiful boutique sofas that were extremely comfy! Already a great start. I'm not sure about you but Afternoon Teas can get a little too sweet for me and I end up not finishing all the cakes in one sitting. This is where Opus One stood out from the other Afternoon Teas I have had. They give you the option of: Traditional Afternoon tea, Celebration Afternoon Tea and Gentlemen's Afternoon Tea. We went for 2 Gentlemen's and 1 traditional as all 3 of us enjoy just that little bit more savoury than sweet. Mini hot yorkshire pudding with beef and gravy in the middle. They also have a lovely selection of teas to go with your afternoon tea - we opted for Assam, Ceylon and English Breakfast. The tea arrived first and in all honesty, I was slightly underwhelmed by the teapots they were served in; very average metal teapots I would expect during breakfast in an average hotel. I know I know, but crockery style does play a part in what should be a luxury treat. It's like buying a car that has beautiful trims, leather seats, leather steering wheel, built in sat nav, cruise control, the whole shebang; only to see that there are no alloy wheels. Just hubcaps. The waitress then comes in with the goods and at that moment, the average teapots were forgotten about. Everything looked so pretty and most importantly, scrumptious! The rustic sandwiches had two layers to them which just added to what was already a pretty damn good sandwich. Mini Pork Pies - Now I'm not normally a fan of pork pies, mainly because the ones I have had in the past were just cold, fatty, over salty meat surrounded by tasteless pastry (the thought of it makes me want to hurl) but this one was pretty damn tasty. The pie was warm and the pastry crumbled when you take the initial bite, then it melts in the mouth so beautifully. It is most likely not any healthier than your average pork pie (in fact, I'm pretty sure the pastry was made using lard) but damn, it was good! Yorkshire Pudding - I wish I had eaten this first because by the time I got to the yorkshire, it had become cold. Even when it was cold the flavours were really good so imagine it being nice and hot - that silky rich gravy with the slither of roast beef, in a nice crispy yorkshire pudding...drooling yet? Fish and Chips - slightly underwhelming with the fish and chips looking a little overdone, and the mushy peas made the fish batter slight soggy after a while, so tip: eat it after the yorkshire pudding. After the lovely savoury options, I turned my attention to the sweet tower. From what I could see, there was fruit tart, chocolate fudge cake, bake well traybake and a prosecco jelly. I only managed to try the fruit tart and jelly from the sweet tower, then a scone. I wish I could have tried the rest but I was just so full from all the food - it doesn't look much but it's certainly filling, maybe it was the pork pie. The fruit tart seemed like it had been left out a little too long as the pastry was slightly soggy, but the creme pat was smooth and creamy. I wasn't sure what the jelly was at first but I knew I wanted to try it - the prosecco jelly was quite refreshing and wasn't too sweet so it went down very easily. The scones were beautifully light which surprised me as most scones i have had with afternoon teas have been quite dense. Topped with a dollop of clotted cream and jam (the best way to eat scones, in my opinion) makes this one of the best scones I have had this year. Now that I have returned to Scotland, I am currently seeking out a place that does savoury afternoon teas like Opus One does. 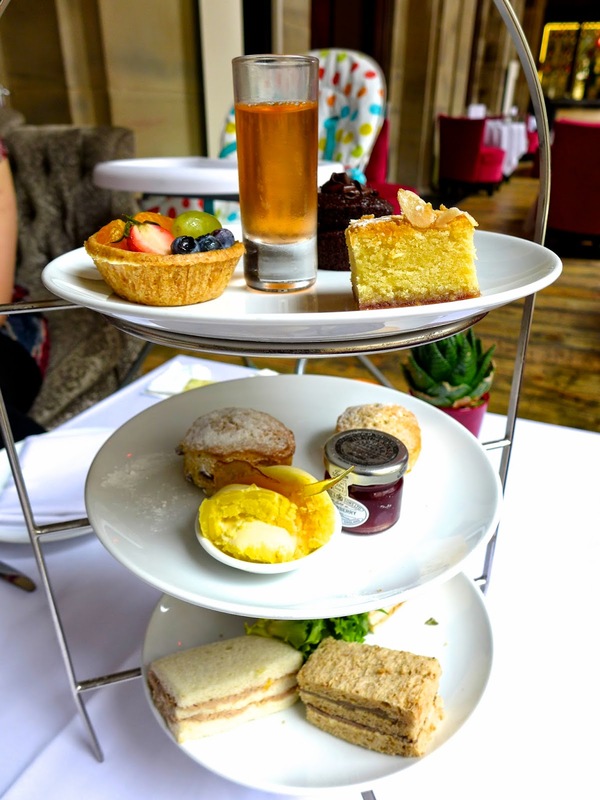 The whole experience felt quite luxurious and if I lived in Manchester, Opus One would no doubt be the place I would go to for a bit of Afternoon Tea with friends. The choice of sweet or savoury will please different palates for sure. Lucky lady - that all looks absolutely delicious! Wow! 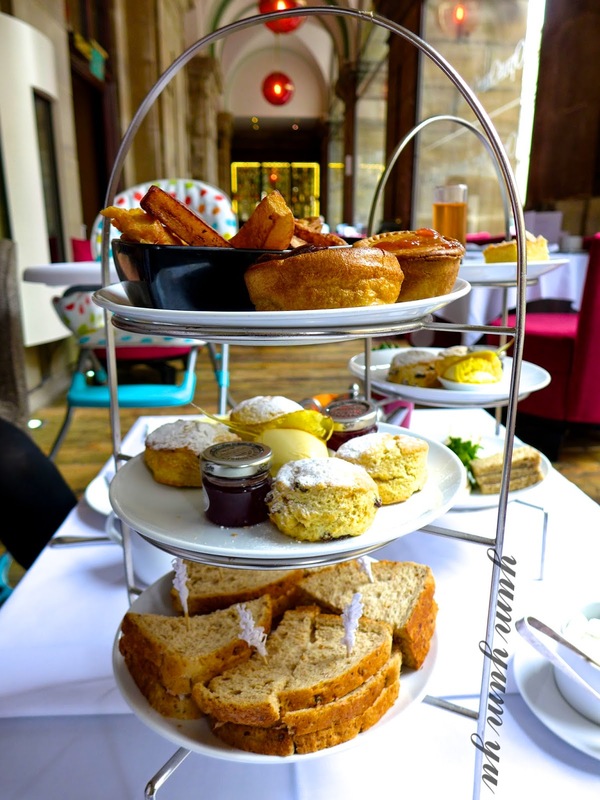 Coming from the states, I've never actually had afternoon tea before, but these look delicious! The whole idea of afternoon tea seems so elegant to me! The three options all seem to have a lot of food! 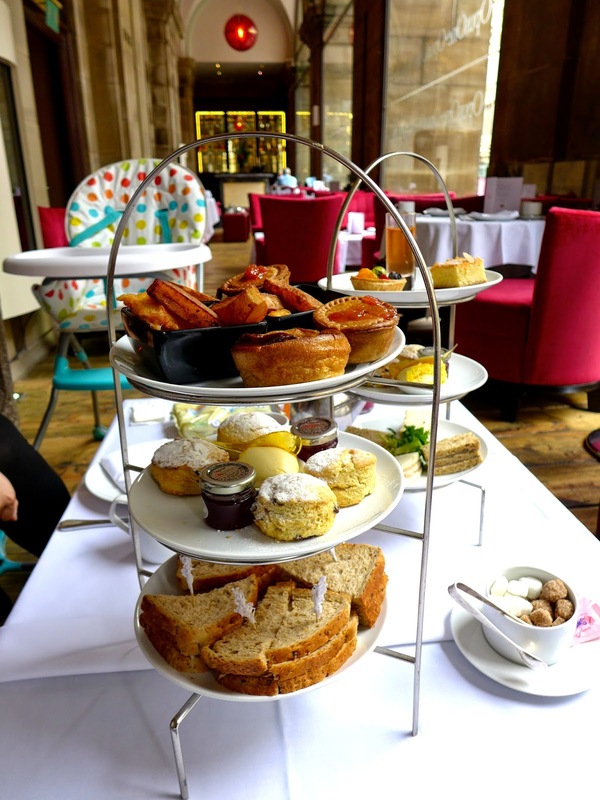 Do afternoon teas typically have about the same amount of food as a regular meal? Yeah, I would say the food you get in an Afternoon tea would equal to that to a regular meal. It also depends on what someone's regular meal is like lol! I always find that afternoon teas never look a lot but when I eat it, I always end up taking some cakes home with me because I can't finish it.